Welcome to the sshg_promptfest! 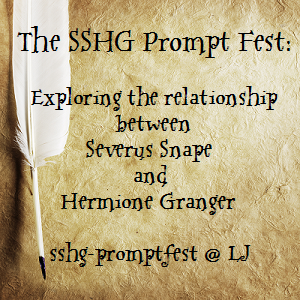 The SSHG Prompt Fest is an anonymous, prompt-based fest that explores the relationship between Severus Snape and Hermione Granger with a showcase of new, stand-alone fan works. We invite you to participate in the Prompt Fest if you're 18 or older, which you can verify by joining and watching the community. Once you've verified your age, you'll have the opportunity to offer prompts to the community, claim prompts from the community, and produce SS/HG (het) and SS & HG (gen) fan works of any rating for the community. The sshg_promptfest previously ran in July 2013, January 2014, July 2014, July 2015, July 2016, July 2017, and July 2018. Before you join and watch the community, familiarise yourself with the Prompt Fest's rules, schedule, and submission guidelines and direct any questions or concerns about them to the mod account, sshg.promptfest [at] gmail [dot] com. The SSHG Prompt Fest runs on Eastern Time. Read on to learn how to participate in the Prompt Fest! Prompt Collection (1-30 March): During the prompt-collection period, offer one set of five brief, inspirational rather than instructional, prompts by copying and pasting the prompt-offering template into a comment in reply to the prompt-collection post (or by emailing your prompt set to sshg.promptfest [at] gmail [dot] com if you're not on LJ). Remove the brackets and tailor the template appropriately. Do not edit your prompt set after submitting it. Prompt Review (31 March): During the 24-hour prompt-review period, decide which five prompts you'd like to claim in order of preference. Prompt Claiming (1 April-15 May): During the prompt-claiming period, claim prompts by copying and pasting the prompt-claiming template into the prompt-claiming post (or by emailing your prompt claim to sshg.promptfest [at] gmail [dot] com if you're not on LJ). Remove the brackets and tailor the template appropriately. Do not edit your prompt claim after submitting it. Prompt Assignment (1 April-15 May) & Fan Work Preview: Reply to your prompt assignment upon receipt of it to confirm your email address and verify your intention to participate in the Prompt Fest. Once that's done, friend the sshg_pf_mod if you'd like a private preview of your fan work before it posts in July. Production Period (April-May), Submission Guidelines, & Deadline Day (31 May): During the production period, produce, have beta'd, and submit your new, stand-alone fan work to sshg.promptfest [at] gmail [dot] com by the 31 May deadline; your fan work must fit into one LJ post. Don't share your fan work with anyone other than your beta(s) because the Prompt Fest is anonymous in every respect before the Reveal. If you submit a fan work before 15 May and would like to answer another prompt, you may do so by emailing your subsequent prompt claim to the mod account; your deadline will remain 31 May. Your artwork should be in the neighborhood of 800 by 600 pixels and submitted as a GIF, JPEG, or PNG file. Your header should be formatted in HTML as a TXT file. Attach both files to your submission email. Use the Prompt Fest header when formatting your artwork header or fic; remove the brackets and tailor the template appropriately. Posting Period (1-30 July): During the posting period, follow the Prompt Fest and comment on the works that move you. If you like, you may anonymously reply to any comments that your fan work receives. The Reveal (31 July): After the Reveal posts, thank everyone involved in making the Prompt Fest a success before pseudonymously answering any comments that your fan work receives and posting it elsewhere—and accept our invitation to participate in the next run of the sshg_promptfest! Direct your fest-related questions and concerns to sshg.promptfest [at] gmail [dot] com, particularly if you find that you must drop out or would like to arrange an extension. The sshg_promptfest is proudly affiliated with the sshg_exchange, the sshg_giftfest, and sshg_smut. It features fan works based on characters and situations created by J. K. Rowling, and owned by J. K. Rowling and various publishers, including but not limited to Bloomsbury Books, Scholastic Books, Raincoast Books, and Warner Bros., Inc. No money is being made and no copyright or trademark infringement is intended by the posting of these fan works. Last updated 19 July 2018.